You are at:Home»iPhone»Power»How Do I Restart An iPhone Without The Power Button? The Fix! You want to restart your iPhone, but its power button is broken, jammed, or stuck. Restarting an iPhone is a two-step process in iOS 10, and in iOS 11 (due to be released this fall), you can restart your iPhone by hitting one button in AssistiveTouch. In this article, I’ll show you how to restart an iPhone without the power button! If your iPhone is running iOS 10, restarting an iPhone without a power button is a two-step process. First you’ll need to turn off your iPhone, and then you’ll turn it back on by plugging it into power. This isn’t the same as a hard reset, but it accomplishes the same thing. This should answer one question that a lot of people have: If your iPhone turns off and the power button doesn’t work, you can always turn it back on by plugging your iPhone into any power source. In order to restart an iPhone without the power button, you’ll need to turn on AssistiveTouch. AssistiveTouch creates a virtual Home button that appears on your iPhone’s display, giving your iPhone all of its functionality even when its physical buttons are broken, jammed, or stuck. To turn on AssistiveTouch, open the Settings app and tap General -> Accessibility -> AssistiveTouch. Then, turn on the switch next to AssistiveTouch (you’ll know it’s on when the switch is green and positioned to the right). Finally, the virtual AssistiveTouch Home button will appear on your iPhone’s display, which you can drag anywhere on your iPhone’s screen. To restart your iPhone using iOS 10, tap the white circular AssistiveTouch button on the screen to open the AssistiveTouch menu. If you don’t see the button, go back to the previous step and make sure AssistiveTouch is turned on. 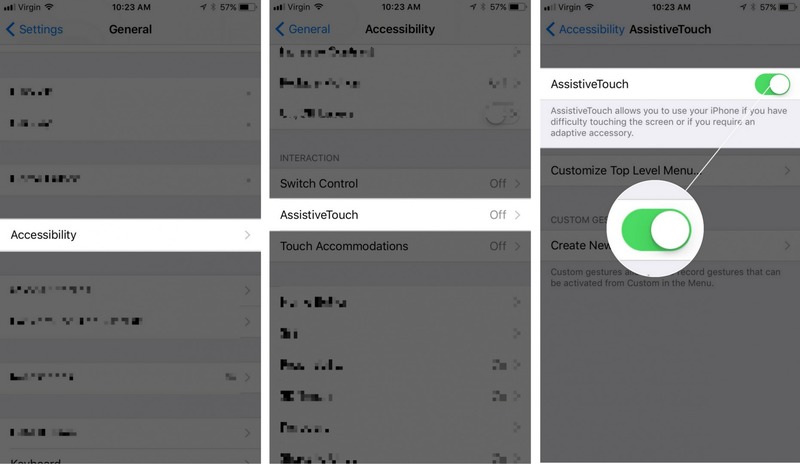 Next, tap Device, and then press and hold the Lock Screen button in AssistiveTouch just like you would hold the physical power button on the side of your iPhone. After several seconds of holding the Lock Screen button, you’ll see slide to power off appear on the screen. Use your finger to slide the power icon from left to right on the screen and wait for your iPhone to turn off. The ability to restart an iPhone without the power button was introduced with the iOS 11 software update. To update iOS on your iPhone, open the Settings app and tap General -> Software Update. If an update is available, tap Download and Install. The update process may take awhile, so be patient! Tap the virtual AssistiveTouch button. Tap the Device icon . Tap the Restart icon . Tap Restart when the alert appears on your iPhone’s display. Your iPhone turn off, then back on after about 30 seconds. You now know how to restart an iPhone without the power button! If your power button is broken, make sure to check out our article on stuck iPhone power buttons to learn about your best repair options. Feel free to leave us a comment down below if you have any other questions about your iPhone, and don’t forget to share this article on social media. Previous ArticleMy iPhone Won’t Play YouTube Videos! Here’s Why & The Fix. Next Article How Do I Turn On The One-Handed Keyboard On An iPhone? The Fix!